Sketching has its perks, specially in this country because you get invited to all sorts of interesting events, that you otherwise wouldn’t have a clue about. Well, it might not be entirely true for everybody, considering how well networked and resourceful some people are, but being an expatriate trying to get intimate with the country she is living in, invitations to events featuring local history, culture, heritage and people in some way or the other is serendipity dropping into your hands like a ripe plum. And what better way to explore a country intimately than sketching your backyard and writing about it, specially if it’s a diverse 710 sq km city state, that you can cross via subway in less than two hours! The possibilities are endless, although I didn’t harbour this mindset two years back when like many others I was trapped in the hamster wheel of shopping malls, food courts, boutique cafes and movie theatres. That’s all there is to do in Singapore, I thought. But somehow, this simple attempt at documenting life through sketching has freed me off the nasty blinkers. Since then, I have befriended locals and heard their stories, observed their diurnal rhythms, their idiosyncrasies, mannerisms, their pidgin lingo, their obsession with food, their materialism and altruism, their traditions and customs – those celebrated widely with pomp across the island as well as those that falter at the brink of oblivion, their collective sense of pride and also their anxiousness, their self expression, their drive to grow, develop, compete and succeed both globally and locally and also their struggle to conserve their identity and heritage in the wake of urbanisation and immigration. Not just sketching, but sketching with a purpose has opened my eyes. 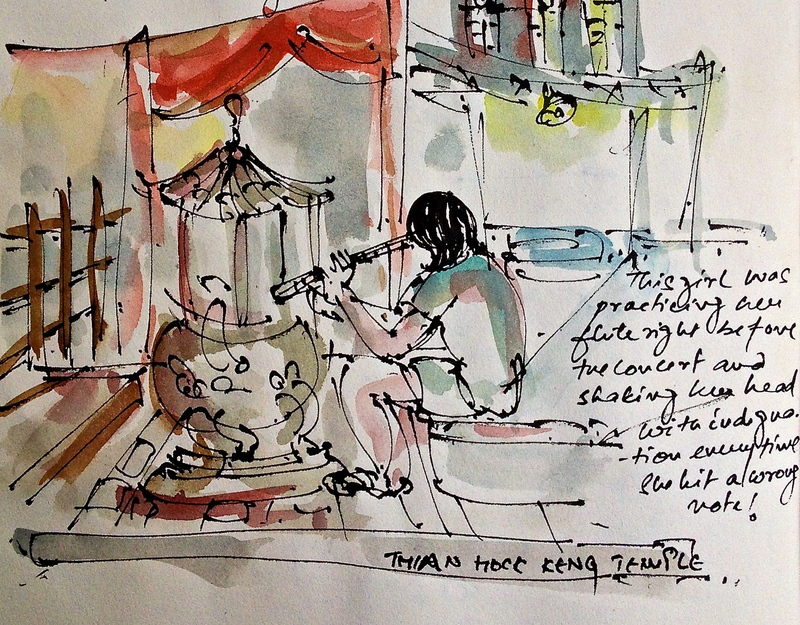 My sketch reportage of many such events I’d been invited to, though disparate – like recording the make-up session of a Teochew opera group, or trying my hand at wrapping rice dumplings at a Taoist temple, or drinking coffee at a shophouse kopitiam or visiting a heritage Peranakan house and so on – have brought me closer to understanding the country I live in. 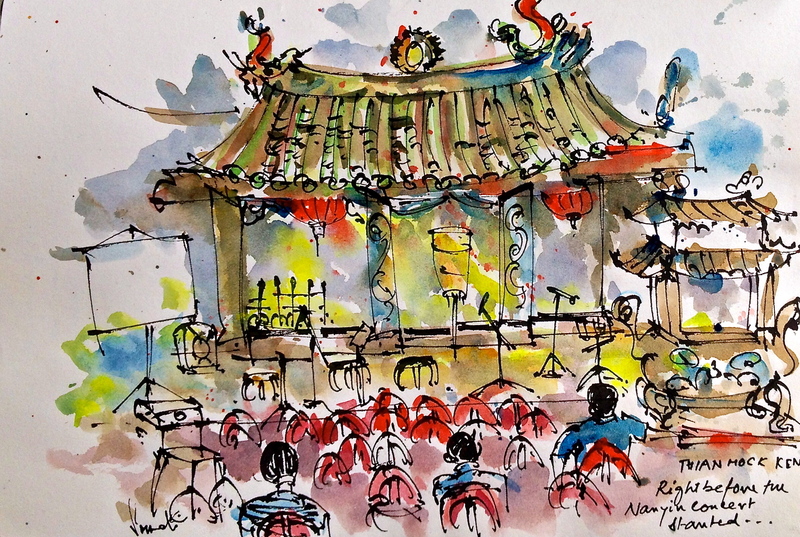 And what more, the equation is symbiotic – while the invitee gets an interesting premise to sketch and talk about, the inviter gets to promote a cause or create awareness, which brings me to the courtyard of Thian Hock Keng Temple, on 158 Telok Ayer Street, where I along with other fellow sketchers have gathered upon one such invitation – to sketch and see a Nanyin concert performed on the temple premises only thrice a year by Siong Leng Musical Association. Sitting in a lone corner in the outer courtyard, this girl was practicing her flute right before the concert began. It is not everyday that you experience centuries old and preserved art form, performed against an equally historic backdrop, so I took the bait the moment it appeared in my newsfeed. The temple’s location couldn’t have been more incongruous, with sparkling high-rises, nifty eateries and watering holes in the vicinity. I wanted to slow down and process the interesting juxtaposition but instead was taking long strides towards the temple, to catch some of the receding light and start sketching before it hit 7. Because at 7 in the evening, the sun goes down in this country, every single day of the year with such mundane consistency that can only be managed if you’re just a degree away from of the equator. By the time I post myself by a kerb opposite the magnificent facade of the temple, a gigantic truck plonks itself in front and blocks my view. Cars are zipping past and waves of people are making their way from work, without so much as glancing at the imposing green tiled roofs and the multicoloured motifs, the fiery dragons charging at the sky, the carved pillars and the massive red lanterns. It is amusing to even imagine that in 1820, when the temple used to be a humble joss house, early immigrants from Fukien Province in China, who’d voyaged across the turbulent South China Sea, flocked in to offer their gratitude to Ma Zhu – the goddess of the sea, even before they went scouting for work and shelter. Before land reclamation of 1880, Telok (bay in Malay) Ayer( water in Malay) was the seafront! From where I stand, I can see plastic chairs being arranged and the stage being set up for the concert. TV crews are interviewing the organisers and the glare from their portable LED light is gushing out through the massive wooden doors and blinding my vision. Dodging the parked truck and the dazzling light, I further shift my vantage point and begin sketching the facade. But darkness has fallen on the city. I struggle to capture the relief patterns on the roof ridges that have been rendered using chien nien technique, a Fujian architectural style, which involves breaking unusable pottery and porcelain to create beautiful three-dimensional work. That’s when Paul, a fellow urban sketcher quipped, “Don’t go for the details, try to capture the essence”. He made it look simple with his casual yet bold strokes that told the story and held it back at the same time for the onlooker to be amused and bemused – a dab of yellow for the blinding light, few sinuous strokes for the temple’s roof, some dark shadows around the threshold and so on. But for some, simplifying isn’t all that simple. The left brain kicks up a storm when you try working at a scene holistically, leaving hints here and there like breadcrumbs leading to a revelation, rather than getting sucked into the details and showing all your cards. The left brain implores you to mark and annotate every stone, tile, wood and all the amazing carvings, intricate sculptures, imposing columns and the decorations with dragons and phoenixes. I try to heed Paul’s advice and try to sketch and paint from what I feel, rather than what I see or straining to see. It isn’t easy. In the temple courtyard, a stage has been set with mikes, stools, projectors and floodlights, the participants are hustling up, some donning make-up, some straightening the creases of their flowing costumes and fixing their hair. A volunteer hurriedly places the concert schedule on every chair. 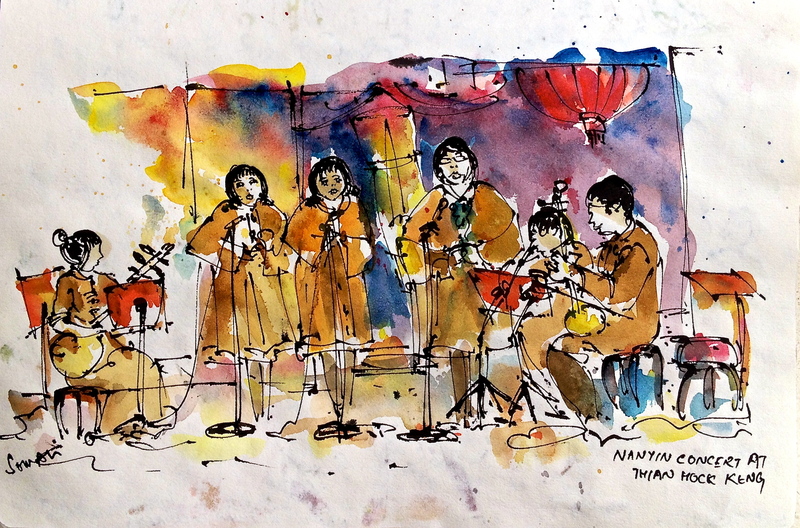 The musical instruments – pie, pipa, samhen, xiao, lihen are lined at the corner, waiting to be picked up. Guests are streaming in, taking places incoherently. A young girl, away from the action is practicing her bamboo flute and shaking her head in indignation, every time she hits a wrong note. Nanyin in progress. The audience is captivated. Nanyin, which literally means the ‘music of the south’ has originated from the southern Chinese province of Fujian and is one of the oldest music genres of China that still exists. The music is soft, gentle and graceful – something that would seep through the pores of your skin and serenade you and fill your senses to the hilt. 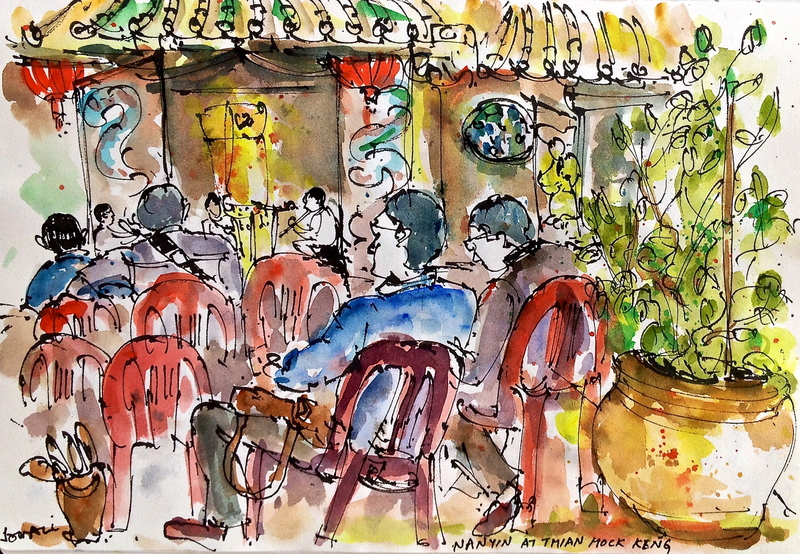 As the music trickled into the temple’s ancient courtyard, the audience – a motley crew of young and old, locals and foreigners, residents and tourist – sat enthralled and motionless, which was perfect for sketching. Understanding the lyrics would’ve heightened my experience, because most of the time it felt like standing at the edge of an alluring pool and not knowing how to swim. Perhaps, my inability kept me rooted to the task at hand without getting emotionally invested. On that night, I let the music guide my pen. 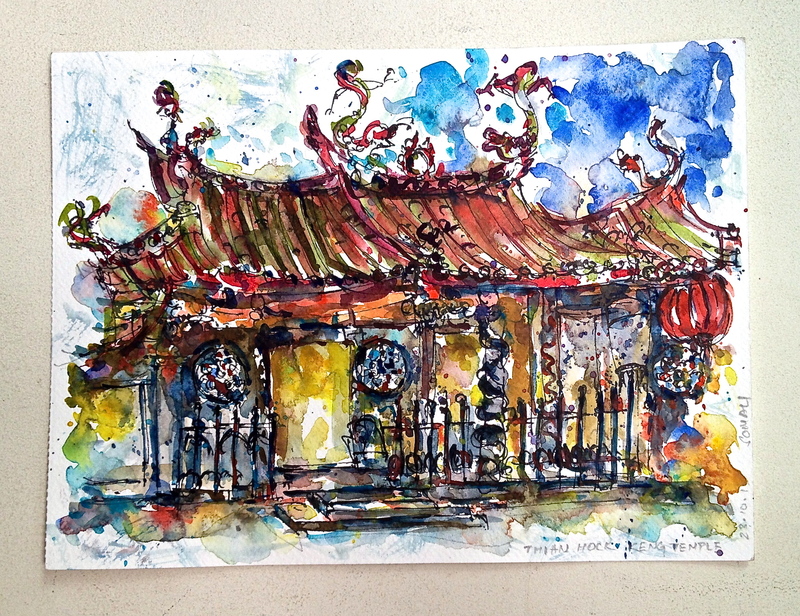 This entry was posted in Daily Vignettes and tagged chien nien, China, Fujian, illustration, Ma Zhu, Nanyin, painting, Singapore, Siong Leng Musical Association, sketching, South China Sea, Telok Ayer, Thian Hock Keng, Thian Hock Keng Temple, Travel on November 12, 2013 by Somali Roy.